If you’re a musician passing through Taos — or a local who’s finally ready to move on from playing Guitar Hero alone in your room to showing off your mad skills to friends and neighbors — good news! 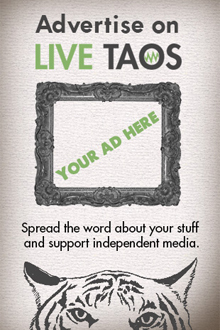 Taos currently boasts a great collection of Open Mic nights. We’ve checked them all out just for you. Here’s the scoop on where to go and what to expect. Let’s go in calendar order, shall we? Kate and Billy’s Medicine Show is a part-curated variety show of sorts, beginning with an open mic night and leading into a performance every week from a featured musician. 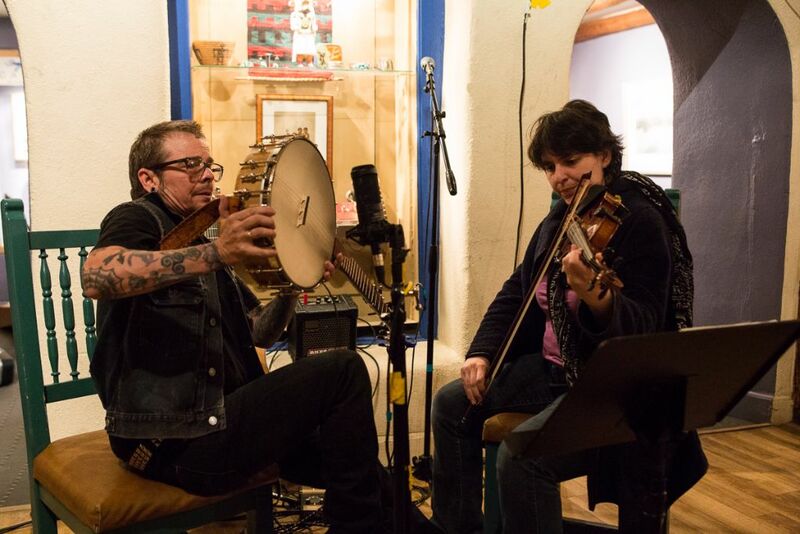 The open mic is hosted by (and the featured musician is often accompanied by) the aforementioned Kate (Mann) and (Banjo) Billy, plus a lot more familiar Taos musical talent. There’s a warm, old-timey feel to this evening of music, and its hybrid nature ensures a well-rounded listening experience if you’re only out to spectate. The open mic segment of the evening happens first; but remember, it’s polite to stick around and support the musicians who play after you. Plus, you’ll catch some great free music, as the featured musicians rotate each week and often include out-of-towners. They do have a guitar to lend out, and there are plenty of folks who will be happy to jump in and jam with you if you’re more of a session-type player. This open mic is a popular one, so arrive early to get a spot on the list! 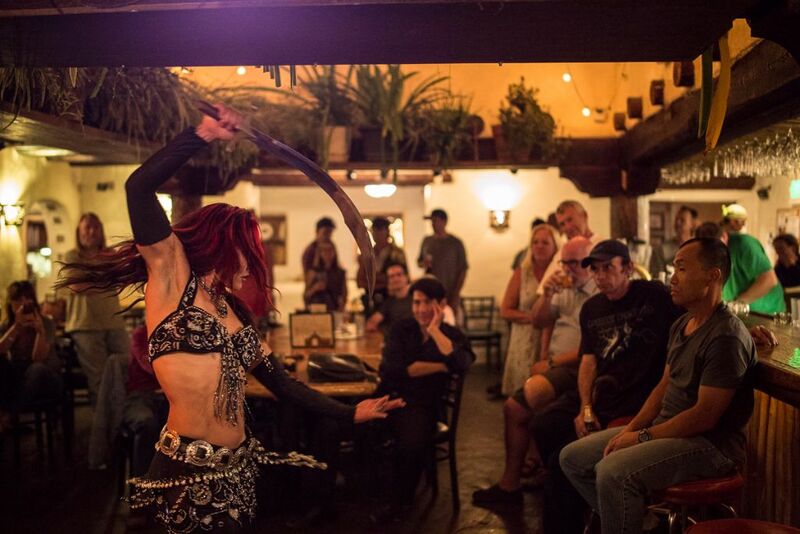 If you’re really on fire after the Medicine Show, you can roll straight on over to the Alley Cantina for Taos Has Talent. This open mic/jam session is a full-band situation, hosted by Cullen Winter. They’ll provide the bass, drums, guitars, and PA, with a rotating cast of talented locals on hand to man whatever you’re not playing. As The Alley is a favorite local late-night joint, this is generally more of a classic bar scene than a listening-room; people might be paying attention to you, or they might be playing pool, catching up with friends, or getting weird in the corner. Don’t take it personally, just shred your heart out. 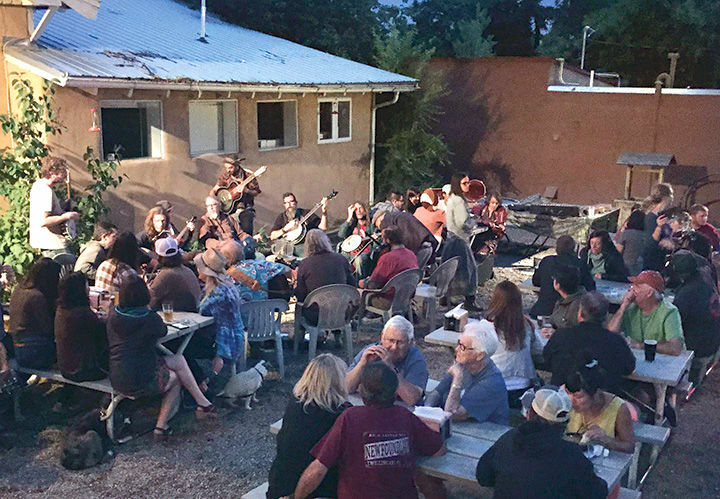 This open mic at the Black Mesa Winery Taos Tasting Room is the most intimate of all the Taos open mics, boasting an incredibly loyal crowd of players and listeners. It’s hosted by Wayne and Renee, the musical duo known as Bittersweet Highway. “If you want to really listen to music, this place is awesome. 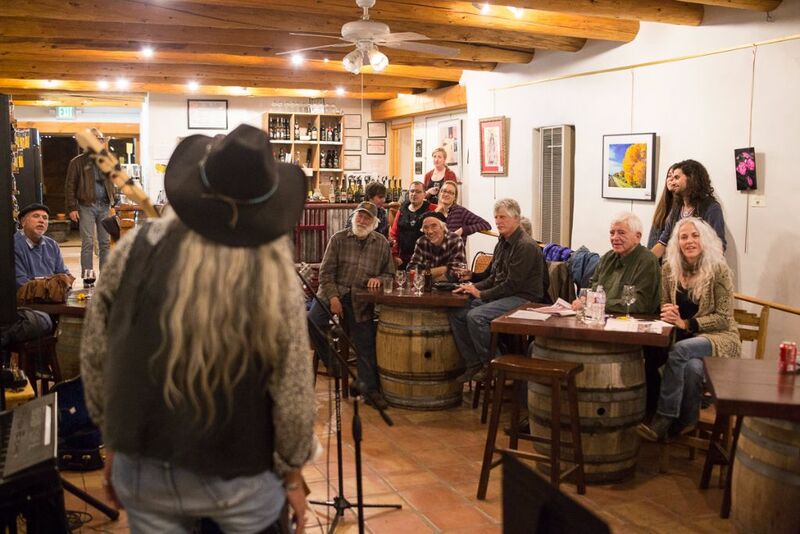 The wine is the best in New Mexico, the service is great; if you come to Taos to listen to music, this is where the singers and songwriters come to play it,” raves Carl Stewart, a longtime veteran of the various Taos open mic nights. What we’re trying to get across here is that the Tuesday night crowd is really here exclusively for this event, so you can count on a proper listening-room atmosphere. So, if you’re hoping to have a boisterous chat with friends, maybe try a different bar on Tuesday nights. But if you’re out trying to listen to some acoustic musicians and maybe take a spin with some of the local two-stepping crowd, this is the place for you. The list fills up quickly here, too, so don’t come late. Wayne will mix the sound for you, but you do need to bring your own instruments to this one. Black Mesa Winery is one of northern New Mexico’s own wineries, so be sure to enjoy some delicious regional wine while you soak in the tunes! The Taos Mesa Brewing Mothership open mic night is hosted by guitarist extraordinaire Ryan “Looper” Beckwith, of Katy P and the Business fame. During the warmer months you’ll enjoy playing outside under the pagoda; as the weather turns, it moves inside to the impressive main stage. “This ‘cafe style’ open mic allows any talent under a respectful decibel level,” says Beckwith. 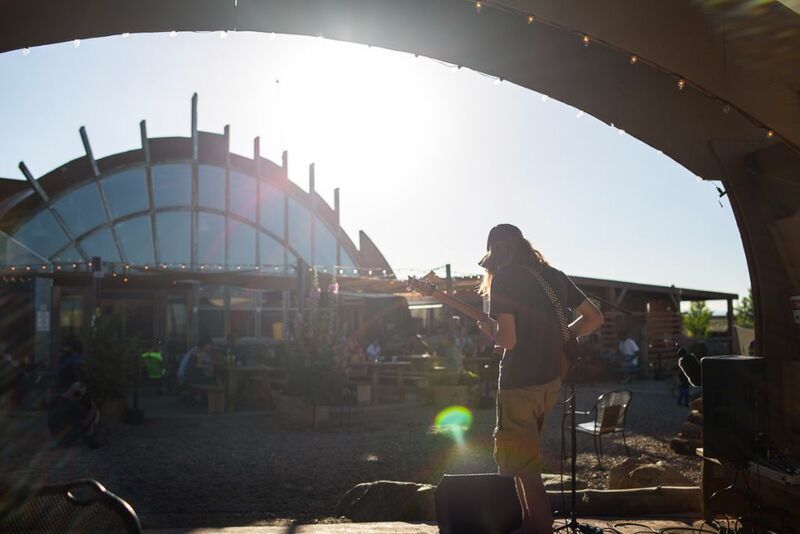 “Most often you’ll catch a guy and his guitar, but sometimes something even more stranglyer.” Taos Mesa Brewing is always worth a visit, with their huge selection of local beers and stunning 360-degree Taos vistas, so be sure to add this to your list. Finally, there’s a Bluegrass/Old-Time String Jam at Eske’s Brew Pub on Wednesday nights, from 6:30pm – 9:30pm. 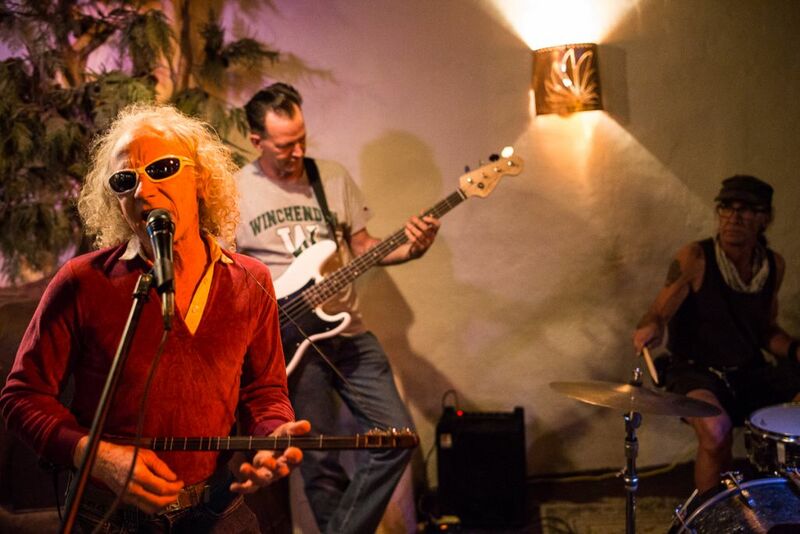 Since it’s not technically an open mic we didn’t include it in our “official” research, but if you’re a picker, it’s a great time and a fun way to meet a rowdy crowd of Taos players. And did we mention that musicians get $2.50 beers? Wherever you decide to go: happy playing, and happy listening! DID WE MISS ONE? Let us know in the comments and we’ll send our team to check it out!